Other names: Bacua, thatch screpine. Mala grows in Malesia, eastern Australia, and the Pacific Islands. It seems to have originated in this region only. 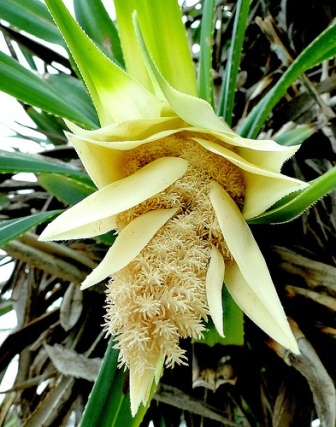 It is quite important plant of this region both economically as well as culturally. Besides food, it is put to many other uses by people of this area. A small dioecious tree growing to 10 meters in height with a canopy spreading 5 to 12 m in diameter; trunk multi-branched and often has aerial roots that descend from the upper canopy to the ground (prop roots). Leaves light, spirally arranged at the ends of the branches and have long linear blades about 4 to 8 cm wide and 80 to 180 cm long; most varieties have spines along the edges and on the midribs of the leaves, Spineless and variegated forms are available. 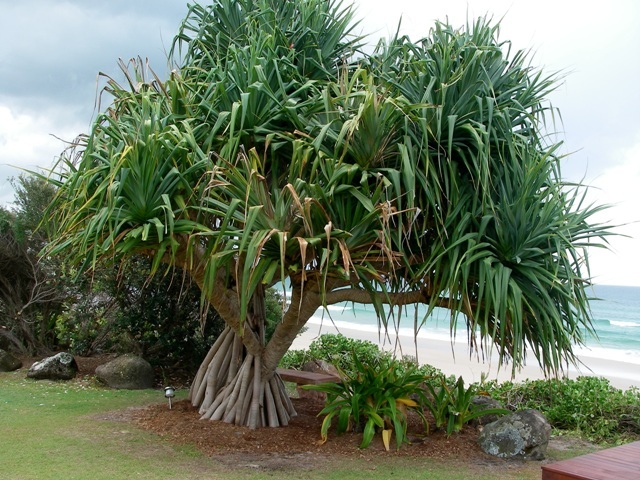 Pandanus tectorius trees are either male or female. 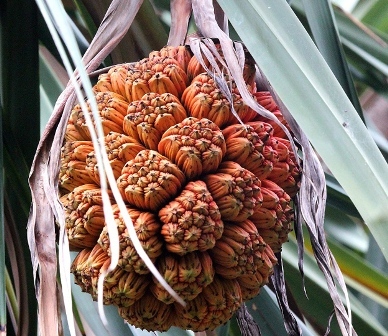 Female trees produce a large, segmented fruit somewhat resembling a pineapple. Male trees produce large clusters of tiny, fragrant flowers surrounded by white to cream colored bracts. These clusters are about 30 cm long and are called hinano in Hawaiian. Fruit is a large, woody, subglobose syncarp with numerous (often 50 or more) woody keys containing a buoyant mesocarp with one or more seeds. Hala fruits are eaten raw as well as cooked. 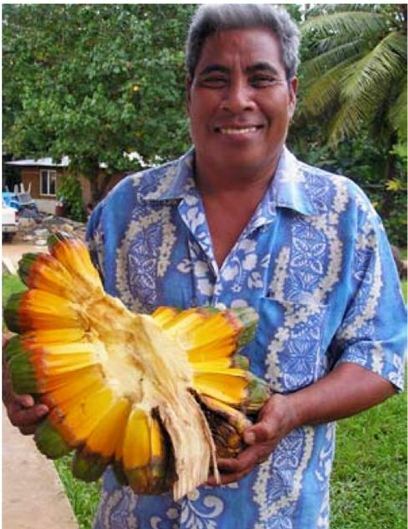 These a major source of food in Micronesia, especially in the atolls. The fibrous nature of the fruit also serves as a natural dental floss. Hala leaves are often used as flavoring for sweet dishes such as kaya jam, and are also said to have medicinal properties. It is also used in Sri Lankan cookery, where the leaves are used to flavor a variety of curries. Leaves are used to make baskets, mats, outrigger canoe sails, thatch roofs and grass skirts. Hala is an excellent choice especially in the windy areas that are poor, sandy or salty. It is also a very good plant for stabilizing coastal area and beach area sandy soils. The female trees provide food. The male trees are very good for landscaping as they provide highly fragrant flowers which are used for floral displays. New plants are raised from suckers as well as seed. Hala trees take long to come into bearing and do not start producing fruits before ten years.